The calibration of a pressure transducer consists of applying specific pressures in very accurately measured steps, and recording the corresponding output (mV, VDC, mA) for each step. The measured output values are then compared with the designed output values to see if they are within the design specifications of the transducer. Periodic calibration of any pressure transducer is recommended as a verification of proper operation within designed specifications. How often a calibration is performed will depend on the application and frequency of use the pressure transducer has seen. For example, an instrument that is used infrequently and merely sits in storage might be calibrated only once every 12-24 months. For transducers that are used to perform aggressive testing on a daily basis, the user may want to calibrate the transducer every few weeks. 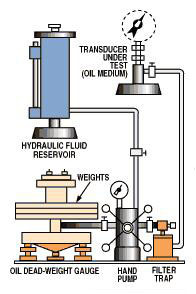 When the application is critical, the user may even decide to calibrate the pressure transducer prior to each test. Taber Industries' recommendation is to calibrate transducers more frequently at first (6-8 months) until the user determines through experience that longer intervals between calibrations are more practical. With over 60 years experience in the design, manufacture and calibration of pressure transducers, Taber Industries has the capabilities and resources to calibrate and repair most pressure transducers we have sold. If a particular transducer has accessible Zero and Span potentiometers, the transducer can often be adjusted so the output is within the designed tolerance. Linearity - the amount of deviation from the transducer's "ideal" straight line performance using the BFSL method. Hysteresis - the ability of the transducer to provide the same output when the same increasing and then decreasing pressures are applied consecutively. Repeatability - the ability of the transducer to produce the same output with consecutive applications of the same pressure. Thermal Sensitivity - the ability of the transducer to produce the same output at a given temperature, before and after a temperature cycle. Thermal Zero Shift - the change in output at a constant pressure as temperature is varied over a stated range. Static Error Band (Static Accuracy) - components of the static error band include linearity, hysteresis, and repeatability calculated using the Root Sum Square (RSS) method. Total Error Band (Static Accuracy through temperatures) - This is the overall accuracy of the transducer representing its calculated Static Accuracy within the Compensated Temperature Range (CTR) for which it was made. To meet a customer's additional requirements, Taber Industries offers special transducer testing services shown below. 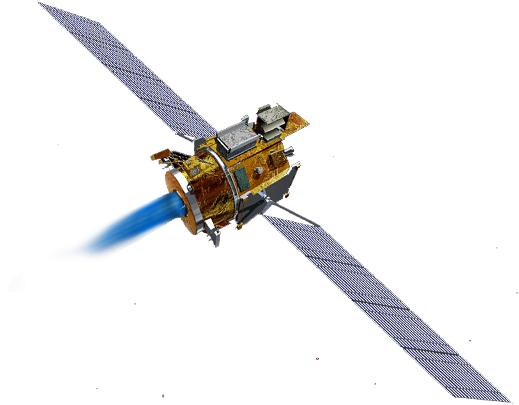 In addition, Taber has a select group of certified testing vendors to perform even more advanced testing for our satellite and space program transducers. If your Taber Industries pressure transducer is in need of repair, contact us for additional information and/or to obtain a Return Material Authorization* (RMA) number - please be prepared to provide the serial number of the transducer. All potential repair units will be assessed a non-refundable evaluation fee. 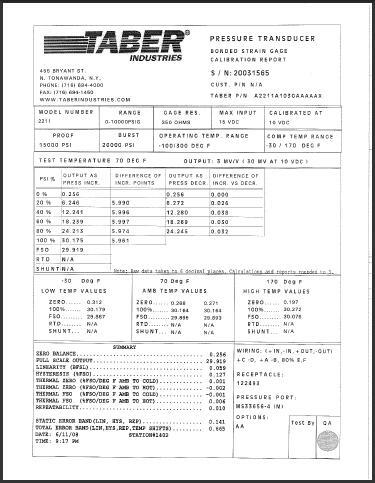 Typical lead-time for evaluation is 2 weeks from receipt of the unit. After evaluation, if unit is repairable, Customer Service will quote repair charges. If the unit is not repairable, and the customer decides to purchase a replacement unit, the evaluation fee will be credited toward the replacement purchase. If you have a Taber pressure transducer and require information about your unit (e.g. excitation requirements, In/Out wiring, or other characteristics), contact us. The information requested may be available in our archives. * Return Material Authorization numbers (RMA) will be issued by Customer Service and are required for all transducer evaluations. The RMA number will be utilized for tracking purposes and needs to be clearly identified on outside of the packaging of the returned unit. Also, a completed Taber Service Request Form needs to be included in the package of the returned unit. DID YOU KNOW? The year of manufacture for of a Taber pressure transducer can be determined by its serial number. Prior to the year 2000, the first two digits of the 6-digit serial number represented the year of its manufacture (e.g. s/n 951234 was made in 1995). In the year 2000, Taber switched to 8-digit serial numbers with the first four digits representing the year of manufacture (e.g. s/n 20101234).